Zlobina OV, Pakhomiy SS, Bucharskaya AB, Bugaeva IO, Maslyakova GN, Khlebtsov NG, Khlebtsov BN, Bogatyrev VA. Accumulation and biodistribution of gold nanoparticles in the mesenteric lymph nodes at oral administration. Russian Open Medical Journal 2013; 2: 0301. The use of nanomaterials in medicine attracts more and more attention of different specialties physicians. It is assumed that their use will lead to the revolutionary advances in the treatment of many diseases through their ability to interact with biological tissues at the molecular and cellular levels [1-3]. In recent years colloidal gold was widely used in oncology, biochemistry, immunology and in the treatment of several autoimmune diseases [4, 5]. However, despite wide application of gold nanoparticles, many aspects of safe use require detailed analysis. In particular, the analysis of relations between the possible toxicity, size duration and route of administration of gold nanoparticles is sufficiently studied. The studies of subtle morphofunctional changes in immune system organs, in particular in the lymph nodes are important in this respect [6, 7]. An analysis of the accumulation and biodistribution of gold nanoparticles (GN) in the mesenteric lymph nodes plays an essential role in the evaluation of immunotoxicity of experimentally test substance which may be indirect evidence of the sequence deployment of the immunological response to oral administration of GN. The purpose of study is to conduct analysis of biodistribution and accumulation of gold nanoparticles in the structural and functional zones of lymph nodes with regard to size of nanoparticles and duration of oral administration. The study was performed on 120 healthy mature albino male rats weight 180-220 g accordingly "Guidelines for the experimental (preclinical) studies of new pharmacological agents" . The study included three series of experiments, in which the animals of experimental groups were administered orally by gold nanoparticles size 1-3 nm, 15 nm and 50 nm for 8, 16 and 30 days. Biopsy specimens were performed after 24 hours of the last administration. Gold nanoparticles size 1-3 nm, 15 nm and 50 nm synthesized in the laboratory Nanobiotechnologies IBPPM RAS (Saratov) were used in the experiment (gold concentration in all samples – 57 ug/ml). To increase biocompatibility and bioavailability, nanoparticles were conjugated with polyethylene glycol PEG-SH (Nektar, USA). 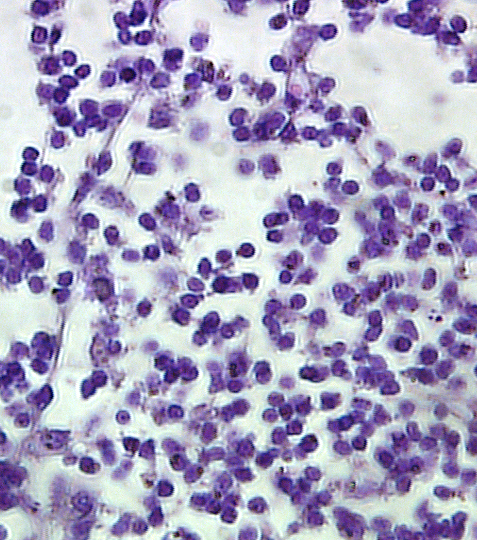 Serial sections of lymph nodes with 5-7 microns in thickness were stained by hematoxylin-eosin. To assess the biodistribution of GN in various areas of mesenteric lymph nodes, dark field microscopy method was applied by using a microscope Leica DM 2500 with color CCD camera and the special attachment that allows to carry out lateral illumination at 1000 × magnification. Dark-field illumination mode was implemented on devices LEICA DM LEICA LMD 2500 and 7000. Lighter LEICA CLS 150 with two optical fibers was used as a source of side lighting (BO) using, fiber tips were set positioning at a distance of about 2 inches on either side of the lens as close as possible to the object plane. 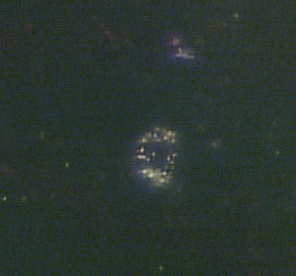 To confirm the identification of GN histochemical reaction of amplification by Danscher silver with silver lactate was used, in which in the case of positive reactions under illumination of "light field transmitted light" gold nanoparticles appear as a large black clusters (aurosomy), in the "dark field" the aurosomes look like brightly glowing objects with red tint on a dark background. A special computer program for analysis of microscopic images of Image J was used to quantify the distribution of aurosomes in different areas of the lymph nodes. The program package «STATISTICA 6.0» (Stat Soft Inc, USA) was used for the statistical analysis of the study results. The verification of the distribution normality of the sample values was performed by using the Kolmogorov-Smirnov test. We calculated the arithmetic mean (M), the average error of the arithmetic mean (m); standard deviation (SD). The significance of differences (P) was determined by using Student's t test. Studies have shown that at 8, 16 and 30 day oral administration of GN size of 1-3 nm the aurosomes were not registered in any of the zones of lymph nodes. It can be assumed that the lack of method sensitivity for the determination of the gold particle sizes is indicated. In the group of animals treated with GN size of 15 nm and 50 nm the aurosomes were detected in all areas of lymph nodes, and the greatest number of them was mentioned in the cerebral region strands. The results of quantitative analysis of aurosomes at administration of GN with different sizes and duration of their administration are shown in Table 1. As follows from the table, GN size of 1-3 nm is not visualized in any of the zones of the lymph nodes. At the same time, regardless of the size of the largest number of GN aurosomes was observed in the area of the brain strands. At 8-day administration of gold nanoparticles size of 15 nm 486±12 aurosomes in the area of lymph follicles are registered, 21±3 aurosomes were registered in paracortical area and 768±21 aurosom were registered in the area of the brain strands (P <0.05). At 8-day administration of 50 nm GN 481±16 aurosomes were observed in the area of brain strands (Figure 1), 357±14 aurosomes were registered in lymph follicle (P<0.05). It should be noted that the number of aurosomes in all zones of lymph nodes was significantly greater at using nanoparticles with size of 15 nm than 50 nm GN in comparable duration of administration (P<0.05). It can be assumed that the lowest amount of GN size 50 nm in the lymph nodes was caused by their large size, hindering absorption in the gastrointestinal tract. This thesis is confirmed by studies of P. Jani et al. , in which the size-dependent effect of suction polystyrene particles (from 50 nm to 3000 nm) was detected. It is interesting to note the fact that at the sizes of 15 nm GN the number of aurosomes in all zones of the lymph nodes increases almost proportionally to the duration of their administration, while AT administration of GN size of 50 nm this growth is not observed. At increasing duration of administration from 8 to 30 days the amount of aurosomes was increased by 38.1% at of 15 nm administrations and by 4.8% at GN size 50 nm administrations. These differences are also may be explanated by insufficient suction of 50 nm nanoparticles in the gastrointestinal tract. A more detailed analysis of the results allowed us to identify large number of phagocytic macrophages filled with gold nanoparticles in the cells of subcapsular sinus. 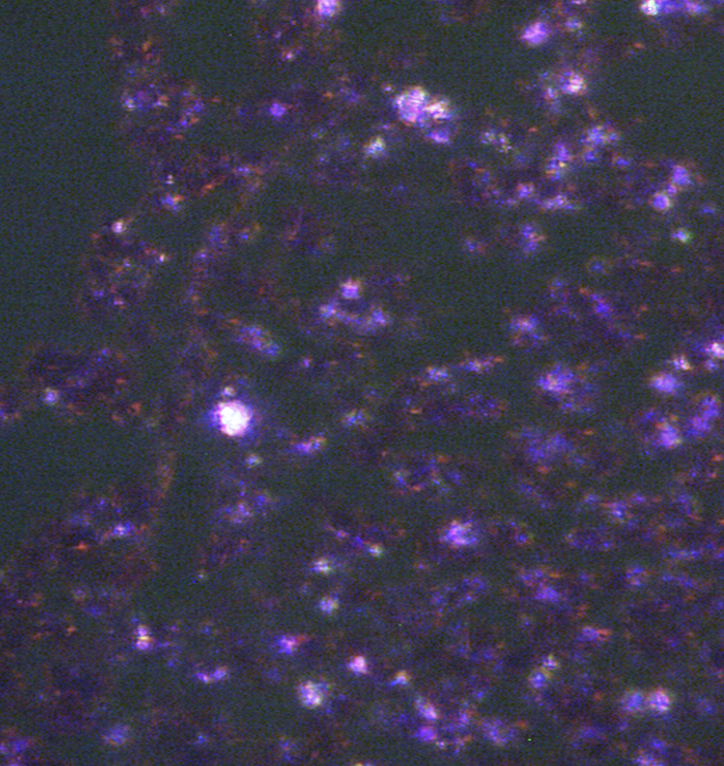 At its research using dark-field microscopy with side lighting a large number of aurosomes was detected in macrophages that confirm the presence of GN (Figure 2). It can be assumed that the enhanced phagocytosis by macrophages is trigger the immune response at administration of GN. Fig. 1(a,b). Area of brain strands of mesenteric lymph nodes at 30- day administration of 50 nm GN. x1000. Hematoxylin-eosin (a). Dark-field microscopy (b). Fig. 2(a,b). 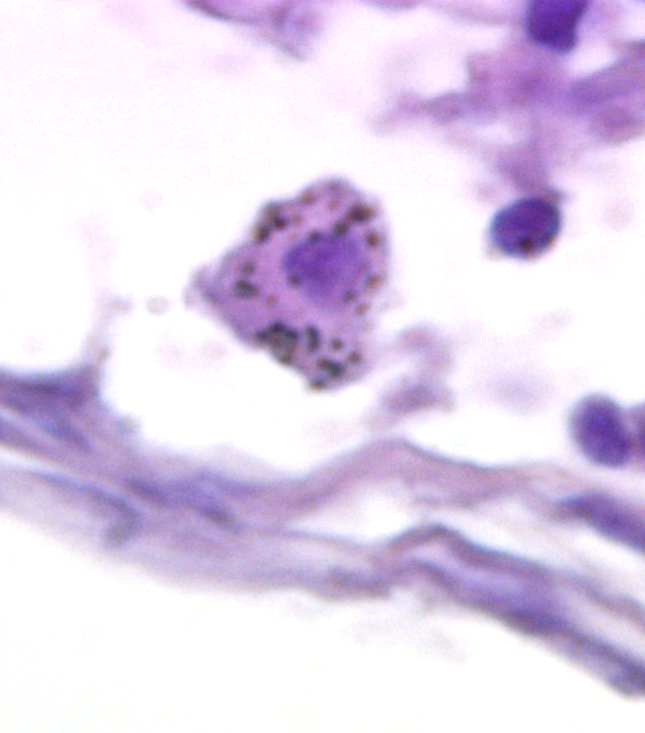 Macrophage in the subcapsular area of mesenteric lymph nodes at 16 day administration of 50 nm GN. Incr.x1500. Hematoxylin-eosin (a). Dark-field microscopy (b). In the latest published data the information of the accumulation and biodistribution of GN in mesenteric lymph nodes are absent . Analysis of the accumulation and distribution of GN in different areas of lymph nodes may be an indirect evidence of the sequence of the deployment of the immunological response. The study founds that GN size 15 and 50 nm are registered in all functional areas of the mesenteric lymph nodes with a maximum accumulation in the cerebral sinuses at different times of administration (8, 16 and 30 days). At the same time GN size of 1-3 nm are not visualized in any of the zones of lymph nodes, which is possible due to the low sensitivity of the method of the study. Biodistribution analysis of gold nanoparticles in the structural areas of lymph nodes in experimental animals shows that gold nanoparticles size 1-3 nm were not registered by darkfield microscopy and autometallography methods. GN size from 15 to 50 nm was detected as conglomerates in cytoplasm of macrophages and lymphocytes predominantly in the mantle zone of the lymphoid follicles, and brain strands. The extracellular accumulation of GN was founded in brain sinuses. Vladimir A. Bogatyrev – D.Sc., Leading researcher, Laboratory of Nanobiotechnology, Institute of Biochemistry and Physiology of Plants and Microorganisms of Russian Academy of Sciences, Saratov, Russia. © 2013, Zlobina O.V., Pakhomiy S.S., Bucharskaya A.B., Bugaeva I.O., Maslyakova G.N., Khlebtsov N.G., Khlebtsov B.N., Bogatyrev V.A. Bogatyrev, Vladimir A. - Bucharskaya, Alla B. - Bugaeva, Irina O. - Khlebtsov, Boris N. - Khlebtsov, Nikolai G. - Maslyakova, Galina N. - Pakhomiy, Svetlana S. - Zlobina, O.V.